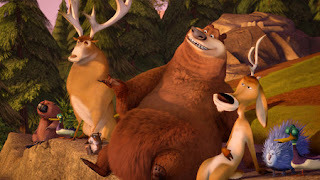 Still the only grizzly in the forest as the second straight-to-disc sequel to 2006’s Sony Pictures Animation studio debut Open Season begins, we quickly discover that Boog the bear is the last member of his increasingly busy circle of woodland creature friends who hasn’t found a date, mate or full time gig. Feeling dejected after the rest of the pack bails on Boog’s annual “guys trip,” including his free-spirited chatterbox mule deer best pal Elliot, whom Boog had rescued from the hood of a hunter’s car in the first Season , the grizzly packs up his stuffed teddy bear Dinkleman and embarks on his own solo version of the weekend. 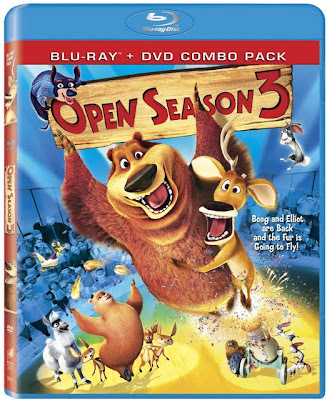 Yet once he realizes that telling campfire tales to a stuffed animal isn’t quite as fun as going on the road with his pals as witnessed in previous installments of the Sony franchise, Boog tries to battle the blues with a kid-friendly version of a Hangover style bender. In another location-based homage to the convenience store utilized in the previous movies, he crashes the just-newly restored, about-to-be-grand-reopened gas station before collapsing in a sugar and salty snack filled heap of candy wrappers, neon slurpy juice, empty chip bags and self-pity. 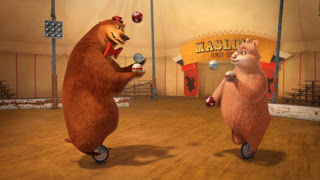 Wandering in a junk food daze onto the grounds of a traveling circus, Boog is thrilled to come face to face with Doug, a grizzly that on first glance could be mistaken for our hero’s long lost twin. As opposed to the cliché of those who want to run away and join the circus, Doug has long been plotting to run away from the circus and join the forest. Tired of being ordered around as part of a group instead of becoming the alpha animal in the wild, Doug yearns for an existence that he imagines Boog’s must be like as the sole grizzly dominating all others. 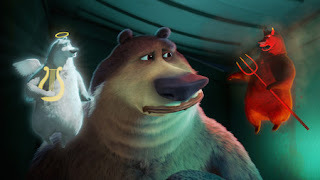 Manipulating the lonely Boog whom we fear would have probably even give up his beloved Dinkleman for a fellow bear friend, particularly after he catches a glimpse of Ursa, a beautiful female Russian grizzly who works alongside Doug in the show, Doug fast-talks Boog into temporarily taking his place. 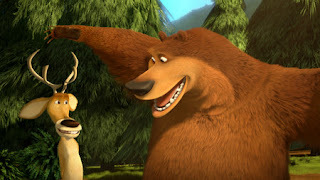 Falsely promising Boog that he’ll back in twenty-four hours – once he’s scouted out a new “Bearvana” location where he’ll live with Ursa and Boog as a grizzly gang of friends – Doug instead ditches our too-trusting lead at the circus, with the sole intention of taking Boog’s place in the forest and turning Boog’s friends into his servants. 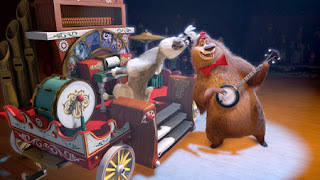 Luckily but amusingly with the exception of Elliot, Boog’s true-blue forest friends aren’t as easily fooled as Doug assumed they would be and sure enough, in true Open Season form, the animals take to the road to bust their bear out of the circus before the show returns to its Russian home. 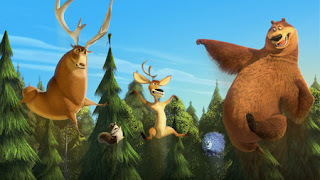 By creatively blending the franchise’s most memorable characters including Open Season 2 ’s comical cadre of clueless yet courageous canines so that initially we have two search parties dead set on rescuing the grizzly until they form one rambunctious team, 3 ’s filmmakers became the series’ most successful in maintaining our interest throughout the movie’s succinct 74 minute running time. 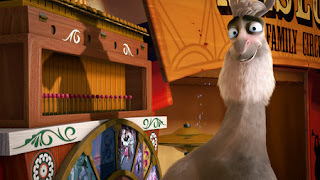 For despite the fact that by now the novelty of a talking animal movie has certainly worn off, particularly for the adults watching alongside their children, there’s an awful lot to admire about Season’s earlier pictures which I recently screened on Blu-ray for the first time in preparation for this review. 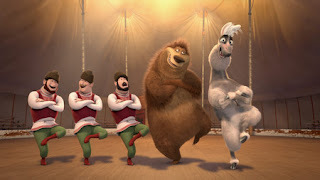 Yes, I do grant that neither title captivated me on the level of Sony’s vastly superior, Academy Award nominated animated work Surf’s Up or the charming sensory overload of the studio’s most successful endeavor Cloudy with a Chance of Meatballs . Yet I was nonetheless instantly attracted to the original film ’s ingenious set-up of matter-of-fact domesticity, which first introduced us to the nine hundred pound Boog, back when he slept in the garage of and was raised by his adoptive park ranger mother. While unfortunately, I think Season never regained its footing nor separated itself from its endless competition from movies like Ice Age and Madagascar by deciding to keep the characters in the wild for the most part -- aside from a brilliantly funny recurring gag involving an overprotective weiner dog owner -- the brightly colored eye-catching palette and thematically upbeat familiar storylines proved enjoyable overall. Yet in stark contrast to the pacing problems that inevitably plagued the other movies, screenwriter David I. Stern livens up Season 3 considerably with engaging tried-and-true subplots that work in everything from road and/or buddy movies to a smart play on The Prince and the Pauper , resulting in a surprisingly engaging sequel that works well from start to finish.